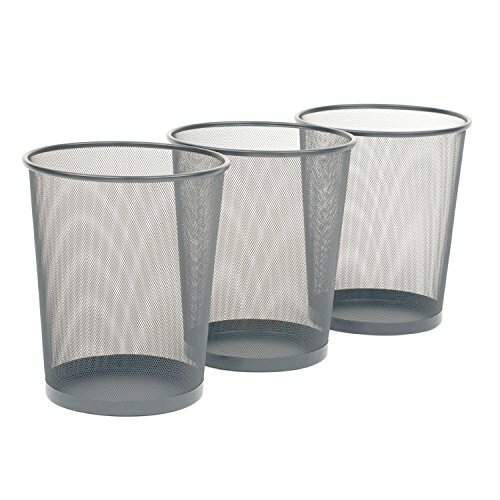 Tidy up around the house with Seville Classics 3-Pack Round Mesh Wastebasket Recycling Bin. Set includes three separate wastebaskets for use as trash can or recycling bin in your home, office, apartment, dorm room and bedroom. Each basket is constructed from steel wire mesh with a reinforced rim and base. A smooth, silver epoxy powder-coat provides protection from corrosion in dry environments. Ventilated mesh design prevents moisture from accumulating and helps to keep the basket dry and sanitary. The tapered cylindrical design features a round top opening measuring 12 inches in diameter. Each basket can store up to 6 gallons (24 quarts), and can be lined with regular 8-gallon trash bags. Use the basket your way: furnish every room of your home with a wastebasket, or outfit a new office with a bin at every desk; use it as a recycling bin for paper waster; or line it with a trash bag for use as a general trash can. Easy to clean with soap and damp cloth; wipe away excess water and let air dry.